Asutype makes sure everything you type is mistake-free and fast, everywhere, all the time. You can try it for free right now. Type "tyvm" to expand to "thank you very much" - type 4 keystrokes instead of 19, to save 79%! Type "utcc" to get "under the current circumstances" - type 4 keystrokes instead of 31, to save 87%! Because of the volume of keystrokes saved, your typing will be easier and faster. There are many text that you can shorten: your address, your signature, your commonly used phrases, often used difficult technical terms, or foreign names, to name a few. Asutype comes with hundreds of most commonly used phrases already shortened, and you can add unlimited new phrases of your own, if you want to. One of the challenges in using word and phrase expansion is memorizing shortcuts. Thanks to Asutype's on-the-fly shortcut creation feature, you don't have to actively memorize them. If you follow a consistent rule of your choosing (i.e. initialism, or abcz) you can just type a shortcut that you feel is right. If your shortcut is defined, Asutype will expand it instantly. If your shortcut is not yet defined, Asutype will popup a suggestion window where you can press F3 to create it on the fly, quickly and easily as shown in the following animation. Not only expanding words and phrases, Asutype also lets you create a text shortcut to expand a whole document that you may type repeatedly, such as an answer for a frequently asked question, a periodic e-mail that you send out to your friends or customers. You can quickly and conveniently insert a whole document simply by typing the shortcut you have assigned to it. 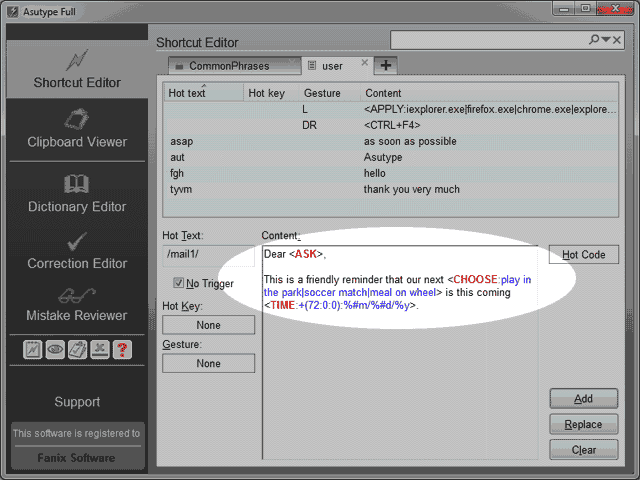 Asutype totally eliminates the need to type the same text over and over again. Asutype's text expansion comes with some easy-to-use macros (or hot codes) that you can embed into your shortcuts to make them versatile and flexible. Your shortcut is flexible because you can use the same shortcut in different situations with expected and consistent results. This is a friendly reminder that our next meal on wheel is this coming Sat 06/11/13. Using flexible shortcuts like that not only reduces the number of shortcuts you have to create and maintain (and thus reduces the memorization need even more), it can also allow you to create templates that you can use to produce standardized documents quickly and easily. Click to Try for Free Now! for immediate mistake-free and fast typing!